I love shopping, but my shopping in NYC is normally limited to the internet considering the hordes of people and horrendously long checkout lines throughout major retailers in the city. However, there are some retailers that just cannot be experienced online: pop-up shops. 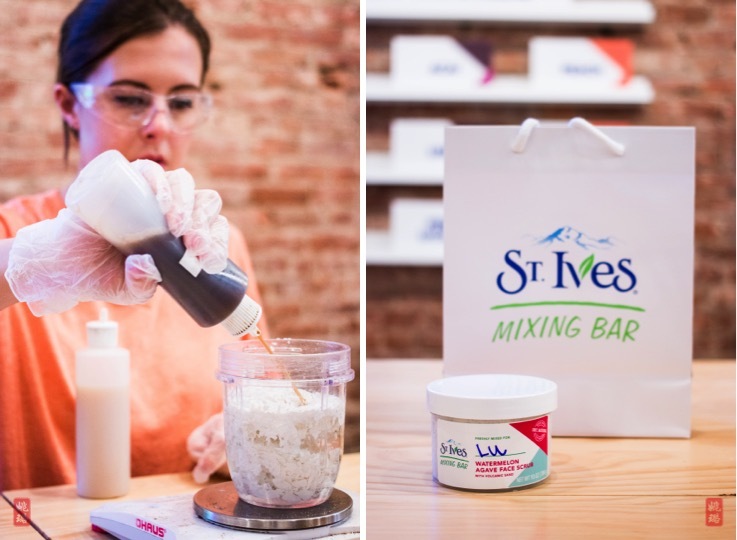 As my husband and I strolled through SoHo last weekend, we came across the St. Ives Mixing Bar, which will be around through September 30 (that's next weekend!!! ), and I was super excited because I have been using their facial scrubs and lotions for years. As you walk in, there is a counter where you can place an order to custom make your own face scrub or lotion, with ingredients that are not offered regularly online or in store. But I would skip that and first go to the back to try or at least smell the combinations they can make for you. I especially LOVED the watermelon face scrub with volcanic sand and the papaya peach body lotion. With your face scrub and body lotion, you can purchase a scent candle as well. As a long time user of these all natural products, it was pretty cool to watch our mixologist make my custom watermelon facial scrub right in front of me. I've used the scrub a number of times since, and it's a much softer exfoliator than the apricot scrub I normally like to use. The volcanic sand leaves my face silky smooth with a summer fresh watermelon scent, which is perfect since autumn still hasn't set in yet in NYC! There is a free sample vending machine that is right next to the purchasing counter. Make sure you pick up your travel size samples before you head out the store! Sometimes the line gets long, and it moves pretty slow. So if you are with another person, it might be a good idea to have one person wait in line and the other try the products. Disclaimer: This post was in no way sponsored by St. Ives.